Beauty and the Beast Review (Live-Action 2017) | Nerd Much? When it comes to trying to review this live-action remake of Beauty and the Beast, it’s been rather difficult to find the right vein to hit. On one hand, the film is beautiful and faithfully sticks to the actual story that everyone remembers from the animated version with very little deviation. Yet, this is also an issue because the movie just amounts to nothing but a really, really expensive fan film. That doesn’t mean it’s not entertaining, but there may not be enough substance to justify seeing this movie outside of nostalgia. 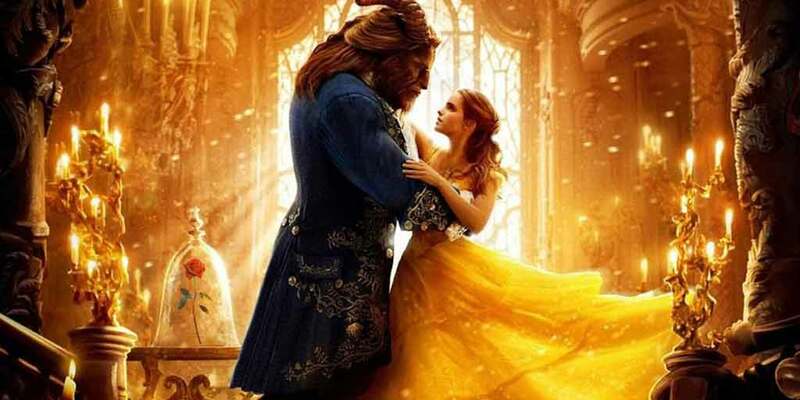 Following the same storyline of the 1991 film, a small village girl named Belle (Emma Watson) agrees to switch places with her father (Kevin Kline) after he is captured by the Beast (Dan Stevens) in an ancient castle. The catch is that in order to break the curse on himself and his servants the Beast needs to not only fall in love but make a woman love him despite his looks. 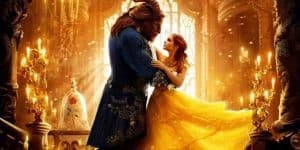 Where Beauty and the Beast differs is it attempts to delve deeper into Belle’s past by explaining what happened to her mother. This is accomplished through a pseudo mix of flashbacks, dialogue with the main cast, and even an additional scene that wasn’t in the original movie. It’s a nice addition and one of the few ones that actually works within the confines of the main plot that has already been established. Giving Belle more characterization beyond “The odd one who, surprise, turns out to be incredibly important) was a nice way to humanize her and have her actions more grounded. A lot of this is thanks to Watson’s wonderful portrayal as Belle as she has great on screen chemistry with Kline and Stevens, allowing her relationships to feel more organic. She captures the innocence yet intelligence that Belle desperately needs and even though her singing is spotty at times, Watson is still a great choice for this lead. Stevens fumbles with his dialogue at times, he does a serviceable job as Beast and strikes a good balance between terrifying, tragic, and funny. Though the animations for Beast are rather hit or miss, especially when its up close on the face since it’s desperately trying to capture all of Stevens reactions in the CGI. However, the star of this film is clearly going to be the self-centered soldier Gaston who is portrayed brilliantly by Luke Evans. It takes a lot to make one of the most obnoxious, self-centered characters ever created actually enjoyable, but Evans adds some much-needed gravitas to the role. This is only enhanced by the story deciding to show just how dangerous and cruel Gaston can be. Given this Disney villain is usually just portrayed as a big idiot, it’s rather nice to see him actually be menacing for once. This is especially true, since it offers a nice dynamic with his friend LeFou (Josh Gad) who couldn’t be more perfectly cast for the role. LeFou is hilarious and while a lot of hoopla has been made about his character being gay it’s nothing that’s going to revolutionize anyone’s perceptions of the character. In fact, most of it is done through side, off-hand remarks and innuendos that most children probably won’t even catch. Whether that’s enough is another story, but for the context of the film, LeFou was enjoyable. Where the film stumbles is that actual beat by beat storytelling, because here just isn’t enough added into the movie to really justify its existence. Sure, seeing all of the now legendary songs reconstructed and placed on a much bigger scale is wonderful, but it just feels odd. There’s nothing truly new outside of a few small additions in terms of backstory that really don’t change anything in regards to the overall narrative. Sure some characters like Belle might be deepened, yet this is just not enough and it makes everything especially predictable. It never feels like director Bill Condon takes any risks with the source material and instead goes out of his way to just remake the animated movie. Beauty and the Beast is, then, pretty much reduced to a much more elaborate fan fiction version of the cartoon that is riding off nostalgia alone. There’s nothing wrong with wanting to see a more glamorized and expensive retelling of this classic Disney tale, it just doesn’t offer much beyond that. This is very much a film that places style over substance, with big elaborate sets and sequences overshadowing any moments the movie tries to slow down for the sake of story. Beauty and the Beast is one of those films that’s clearly made for just the fans and the fans alone, as it offers nothing special to those who don’t have any real affinity to the 1991 movie. If you remove the nostalgia goggles, it’s clear how many flaws this film has, yet that doesn’t detract too much from the enjoyability. Seeing “Be Our Guest” played out before you will invoke a nice sense of whimsy, but if you’re looking for anything more beyond that you will surely be disappointed. This is not the definitive version of Beauty and the Beast, and it’s one clearly made for the fans and the fans alone.